7.30am, cold but sunny and where was I? With about 19 other cyclenix riders of who 3 were "newies" Welcome to Yvette and Ilan who hail from Tel Mond, and Menachem who have joined our ranks. Hope to see all of you many more times in the future and hope that you enjoyed today's outing. Our regular sweep, Ted was not with us today (he had Grandfather duties to perform) and so yours truly assumed the duty. 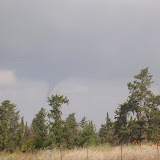 However, after reaching the entrance to Bnei Tzion the sweep was swept away for reasons that will not be expanded upon. Yes, I lost the major part of the group and remained with four others. The larger group took the high road and I took the low road with my four stragglers and we did meet up some 20 kms later at one of our regular breakfast stops, the gas (petrol for those who are not Americans) station at Gaash. David who lead the larger group reported on a very pleasant and somewhat different route from the time I lost them. 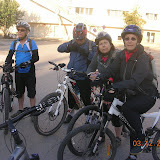 My little group rode on to Udim. The route David took was at least 7 kms longer than my route to Gaash. 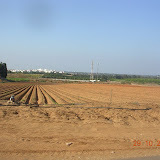 Having satisfied our thirst and hunger we moved on to home base (Ra'anana). All in all we rode at least 32 kms in great weather and excellent company. Question: How far away from home may a Home Patch Ride get? Check with the Cyclenix lawyer for an authoritative opinion. Irrespective of the answer, the riders, or at least those of the 18 at the starting line who didn't break away early for obscure reasons, made it all the way to Reading, and had recorded about 43 km on their odometers by the time they got home. The morning began cold. How cold? Brass monkey cold? And the wind chill made it even colder. But as the sun rose higher in the sky the riders stripped off their outer layers, and it became a perfect day for a little peddling. And, given the foresight of our leaders, we were able to stay well away from anything mudlike. So off to the very new paths on the west side of Herzlia Park we went - a place needing more exploration. Then over the stony, bumpy bits at Tel Michal, a stop at North Tsuk Beach for some puncture repairs and a lesson not to carry prepunctured spares, some pedestrian dodging on and around the Reading Tayelet, up the Yarqon, around Rosh Zipor and a visit to the duck pond, and via the just-reopened underpass to Ramat Hahayal for refreshments. After caffeine replenishment, a swift return through Tsahala and over the Tennis Center bridge, etc., etc..
For the writer of these lines today is an anniversary - one year since the Wounded Knee incident (or, as some might say, accident). Great to be on two wheels again, and especially with what is arguably the largest group of English speaking mountain bikers between the Suez and the Euphrates. Any disputes over the previous sentence should be referred to the aforementioned Cyclenix lawyer. It is also the 4th anniversary of my first ride with Cyclenix - long may we continue to pump the pedals. New Bridge: Not far from our usual Yarkon crossing point there is now a sturdy bridge (thank you KKL for your on-going improvement of our biking/hiking trails). Therefore none of us got his/her feet wet, and therefore others of us missed out on the customary laughs at those who customarily did!!! Bottom Line: Enjoyable ride, perfect weather, excellent company. Riding on the Home Patch after so many years can be boring but when ridden after the first rains each year it takes on a new dimension. The air is crisp with little or no little haze. The clouds are distinct and greyish fluff-like and the sky is a true sky blue. The plants are vibrant greens and colourful with the copious quantity of falling rain and the trails are packed hard (some were not!). The mud was there but we were able to circumnavigate the pools and muddy patches. A fresh SW breeze made the ride painful at times but the otherwise ideal conditions with perfect temperatures made up for the disagreeable wind. 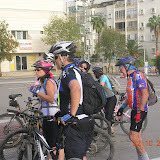 We were reduced in numbers as some of the riders were on the Kinneret ride but we managed quite nicely all 10 of us. Uri left early for his 60th birthday party thinking he had seen the last of us. His wife Etti made sure that we would shortly follow him (after a drink at Gaash) so we gladly rode to Uri's home and joined in the celebration. It was a heart- warming event and apart from David's nuisance flat tyre we can honestly state that it was a great ride. Mazal Tov again to Uri and his tribe. Perfect cycling weather greeted 5 oif us the our usual starting point for what turned out to be a great ride. The ride started at 8am and that extra hour's sleep did us the world of good! Weclome to Irit who had her first ride with the group. We hoipe to see you often on out future rides. 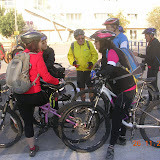 The route took us to the top of the Ra'anana "Rubbish Dump" and after surveying the magnificient view of the surrounding areas we descended and headed off to Yakum, the Gaash Si Service station where we stopped for breakfast and then home. The comapny, food and weather all helped make this a perfect 32 km ride. 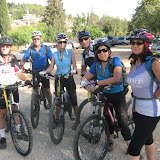 Participants: Nine Cyclenix members participated in this Spokes organized ride to close the Gilat Shalit circle of biking events during the years of Gilat's captivity. Route: For GPS details of the ride go to: http://connect.garmin.com/activity/125000376 Bottom Line: Great ride, perfect weather, excellent company amid superb biking country. At 7 a.m. and half asleep, I joined twelve cheerful morning people at the regular spot opposite Yad Le'Banim. 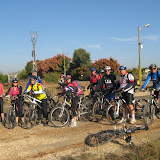 We cycled along Ahuza Street and through the fields beyond Lev Ha'Park, crossing the railway track at Kfar Shmaryahu. From there we turned north, continuing through Yakum and on to Udim. We returned along a different route east of Yakum, and made our way to the coffee shop at the Ga'ash service station. Rested and replenished, we headed home. The highlights of the ride were Gabi's various punctures (apparently due the poor quality of the slime around the inner tubes), the picturesque Yakum Nature Reserve on the way up, the pleasant "singlim" near Yakum on the way back, some challenging uphill sprints, and breakfast. To summarize, it was an enjoyable 34 km with good weather and great company. And many thanks to David, who filled me in on the route after our return, for the purpose of this report! Sometime after we finished the ride David remarked that each time we ride this route in its variations it's like a test to see how age is taking its toll. Rest assured...if we have aged our stamina has not!! Now you know the end so what about the beginning? We set out all seven of us from the car park and commenced the long climb to Tzuba on a bright and breezy morning with the smell of pine to add to the already great morning setting. To our surprise we found the first section to Martyr's Forest Monument is now blacktopped (tarred!) so we breezed up. Naturally the next section was hard going, a long and steep climb that seems to last forever. The lungs worked and the heart beat as we chugged up, envying the occasional rider coming opposite racing downhill. But it was not long that Tzuba was in our reach and within seconds we faced that second challenge of the day...the downhill to Ein Limon. We rode down cautiously avoiding the loose stones, seats down and brakes firm but flexible and in no time we were having a snack by the pool at Ein Limon. The last stage was a mad rush downhill at times over large stones (even a Jeep would find hard going) but we made it down in one piece. David recorded a top speed of over 30KPH but he was not the fastest. We had breakfast at a nearby Market complex and headed for home. Perfect ride that left us all smiling if not a little weary. See the GPS report...total elevation gained 553M. Thanks David!! Here it is, short and sweet. For the first ride of the year 14 of our regulars set out from our usual starting point a wee bit later than the appointed time (not unusual) and we made our way along a well worn route through the Industrial area of Ra'anana, on to Bazra , then Bnei Tzion, Udim, Yaqum with a stop at the Gaash Service station for breakfast and then home. I hope you all had an enjoyable New Year and that we'll have many more happy and interesting rides during the rest of this year. I want to remind you once again that we are on facebook. Join the Cyclenix family there and lets have your comments. Despite the threateningly dark sky, 17 of us set off from the Tennis Court Center in Netanya, going northwards to Nahal Alexander and returning along the Netanya Tayelet. (For details of the route together with other GPS data go to http://connect.garmin.com/activity/116611409# - and to see the route on Google Earth click on "Export" then "Google Earth"). Welcome to some new faces: Vered, Mike and Brian, all local to the Netanya area. Vered deserves a gold star as she has only been cycling for about 2 months and despite feeling ill, soldiered on to finish the close on 40 km ride without a complaint - well done! Brian spends part of the year in tranquil Cornwall and we look forward to seeing him again when returns. 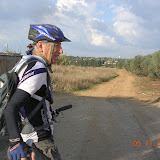 Avi lead us along the labyrinth of roads in Netanya and through the fields to Nahal Alexander. 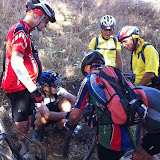 Here we saw huge turtles and a rodent-like creature and, of course, many other cyclists. We returned (after a few going astray) along the tayelet. The clouds must have scared most of the walkers away, as we didn't have to dodge too many people. We stopped off at a cafe to refuel. I can only say that I will not be darkening its door again. It provided a wonderful sea view, but not much else....! The rain stayed away until we reached the cars and then the heavens opened to give us and our bikes a good wash.